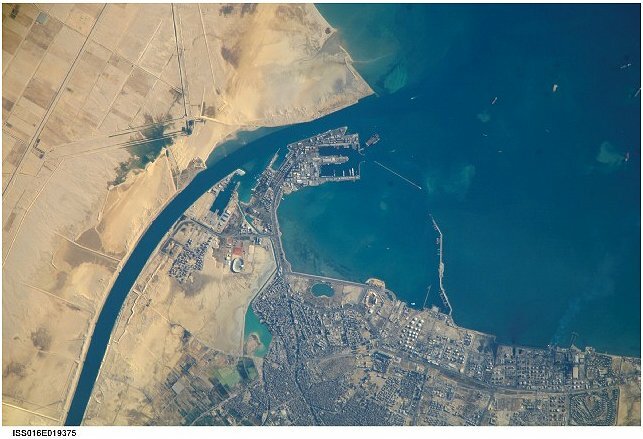 Port of Suez (Egypt) is featured in this image photographed by one crewmember of Expedition 16 on the International Space Station. The Port of Suez is located in Egypt along the northern coastline of the Gulf of Suez. The port and city are the southern terminus of the Suez Canal that transits through Egypt and debouches north into the Mediterranean Sea near Port Said. The port serves vessels transporting general cargo, oil tankers, and both commercial and private passenger vessels. The port is also an important waypoint for Muslim pilgrims traveling to and from Mecca in Saudi Arabia. Several large vessels are visible in the Gulf of Suez and berthed at various docks around the port. An extensive petroleum refinery complex forms the southern coastal boundary of the Port of Suez. At the time this image was acquired (30 December 2007), gaseous byproducts of petroleum processing were being burned off -- as indicated by a smoke plume extending southwards into the Gulf of Suez (lower right). This view also captures several regions of greenish blue coloration in the Gulf. These are most probably sediments stirred up by passage of ships traveling to and from the Port. Similarly-colored regions along the coastline are bottom sediments visible through the shallow water column.